Wednesday, January 17 at 11:00 a.m. -- 1:00 p.m.
Saturday, February 3, 9:00 -- 11:00 a.m. Your LWVPBC Board continues to work in structuring our organization to accommodate our growing membership. We plan to acquire new software to better our membership data management and financial reporting. We hope to continue upgrading our technology in order to stream more meetings to those unable to attend. 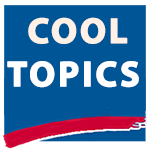 We encourage members to attend committee, Hot Topic, and Cool Topic meetings to learn about all the programs and activities available to members and the community. 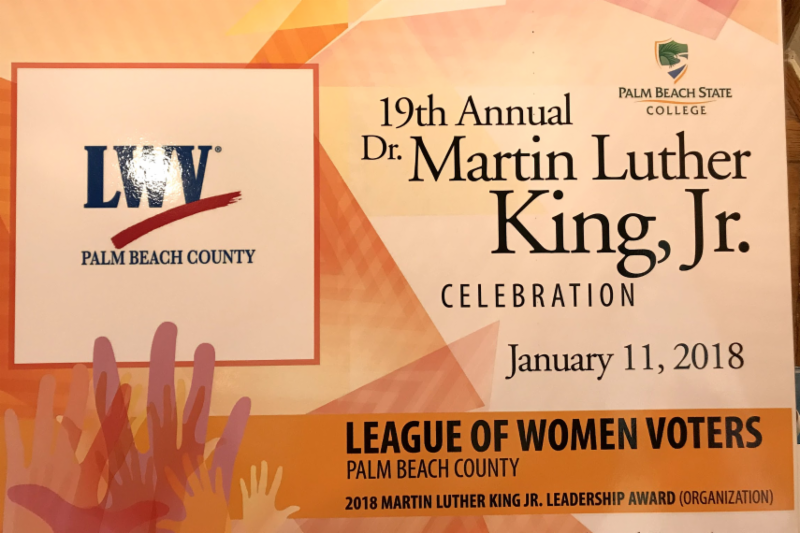 We are proud to announce that LWVPBC has received the Dr. Martin Luther King, Jr. Community Award. 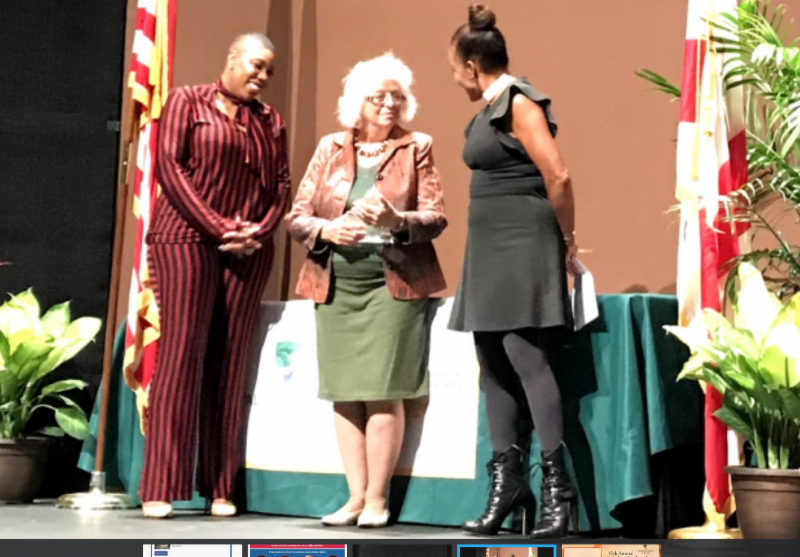 The award was presented on January 11, 2018 at the Dr. Martin Luther King, Jr. Celebration held at the Duncan Theatre on the campus of Palm Beach State College in Lake Worth. The event was an opportunity to hear a wonderful keynote speaker, celebrate our award, and honor the memory of one of our civil rights heroes. League members from all over the state of Florida will be converging in Tallahassee for our annual League Days in Tallahassee. Plan to join us for an opportunity to see your legislature at work and to make your voice heard. Members planning to join us, please contact First Vice-President Debra Chandler so she can include you in materials and preparation. 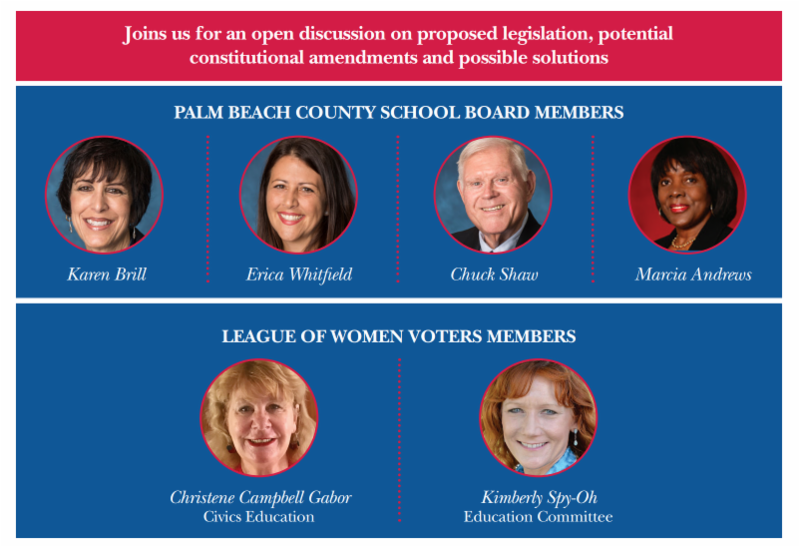 Saturday, Feb 3, 9--11 a.m.
Come to a panel discussion featuring four PBC school board members and two League members. Two years after the historic Paris Agreement on climate, more than 50 heads of state, as well as environment ministers, regional leaders, and bank and finance executives met in Paris on December 12, 2017, to finance global efforts to meet the goals of the agreement. Read reports on the PBC Board of County Commissioners by Andrea Weiss --" The December 19, 2017 PBC Board of County Commissioners meeting included three significant policy issues and was characterized by passionate public participation and some controversy." 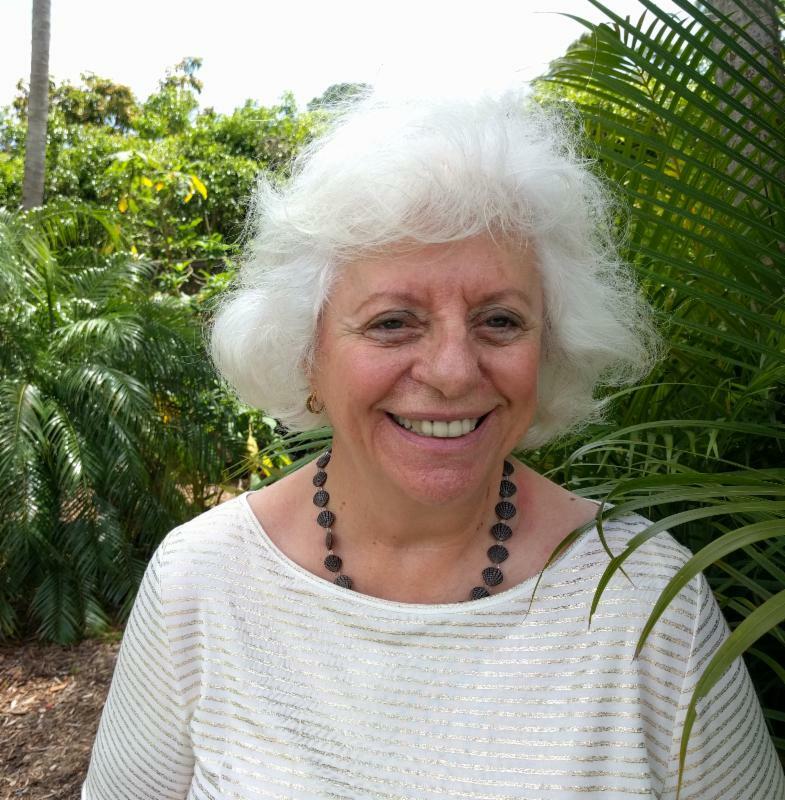 and a Welcoming Cities initiatives in Delray Beach and Boynton Beach by Arlene Ustin--" Whichever way Delray City votes, the process has been thorough and will produce a sound rationale." For contact information on all our members, go to the member directory at lwvpbc.org. For the member password, contact dkostrub@aol.com or 561-852-0496. The NEWS editorial staff apologizes that the list of new members from November 2017 was missed that month. And it was a banner class of new members! Please click the button below to see. Orientation starts promptly at 9:30 a.m.
and ends at 12:30 p.m. This month we update our National Database so that accurate numbers are used for Per Member Payments to both National and State Leagues. It was disappointing that many members didn’t renew for the 2018 year, an important election year. If you are among that group, it’s not too late to correct that and to continue to participate in League’s many vital activities. A check or credit card payment for $60 individual membership will reinstate you to active status. 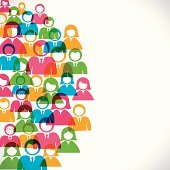 HELP YOUR LEAGUE IN OUR MISSION TO "MAKE DEMOCRACY WORK!" BELOW ARE THREE GREAT OPPORTUNITIES. Can you make calls from home? 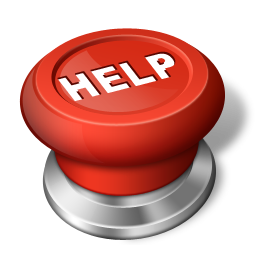 We are looking for members who can make about 10 phone calls a month to other members. Membership Chair Darlene Kostrub will provide names to call and pertinent information. This is a great job for people with limited time to volunteer for other League activities. It is an important way in which we stay connected to members and get their feedback. 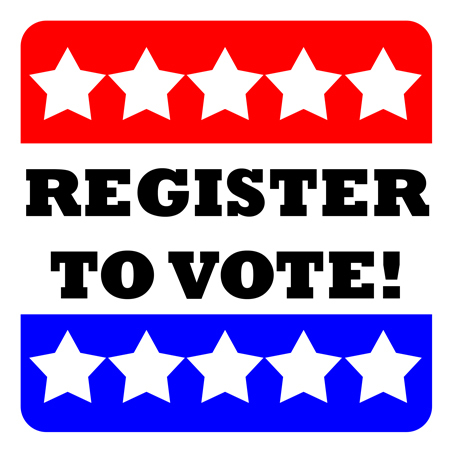 Want to learn how to register voters? In our expanding outreach program, we always need more people as we head into an election year.